It's been a late start this year, not least because of the late April snow! But now, although the weather isn't too brilliant, everything's catching up and there's plenty to do. 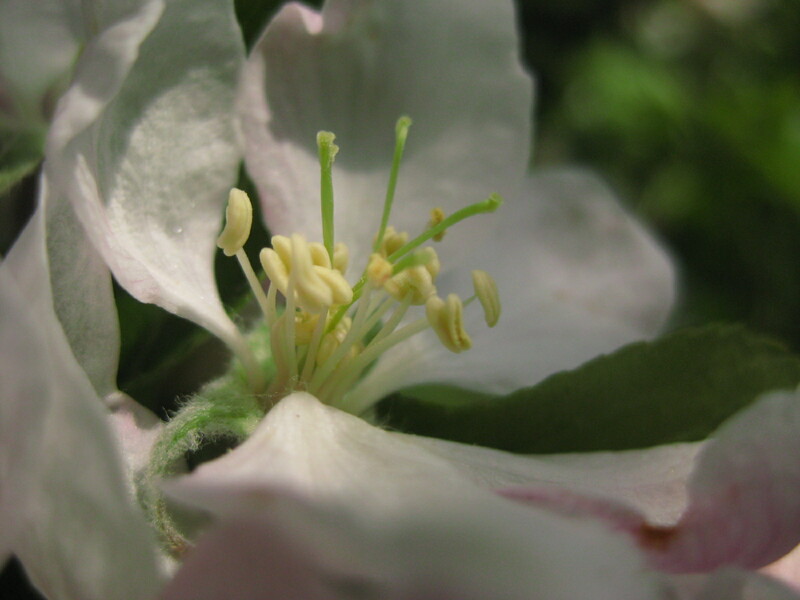 But first, it is such a joy to see the blossom on the fruit trees, and such a challenge to protect it from late frosts like we had at the end of April/start of May! We keep a number of clear plastic sheets and bags at the allotment which can cover up the minarette fruit trees, the strawberries and the grape vine in the event that a frost is forecast. 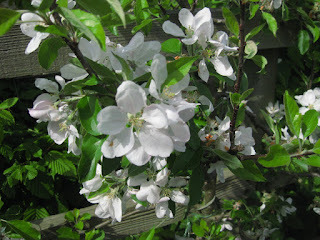 This is the blossom on the Falstaff apple tree that is trained against the rear fence of the allotment. The following link shows the apples that come from it, along with ones from the Chivers Delight and Gala. This is a close up of a blossom flower on the Chivers Delight apple tree. We try to keep the trees around 6ft tall, although the damson seems to have decided it wants to be a grown up damson tree rather than a minarette but we keep it under control! 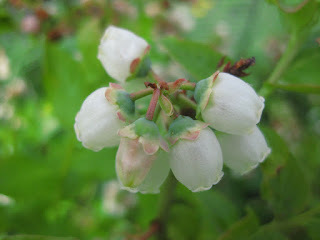 This is a close up of a blueberry blossom. We have three blueberries and after a slow couple of years after which we changed compost (ericaceous) and now all three bushes have loads of blossom and we hope for more than the single jar of jam this year! Now planted in the allotment are peas, sweetcorn, cabbages, a couple of courgettes, onions, parsnips and potatoes. Still being eaten from last season's crops are the last of the purple sprouting broccoli, leeks and new season asparagus. 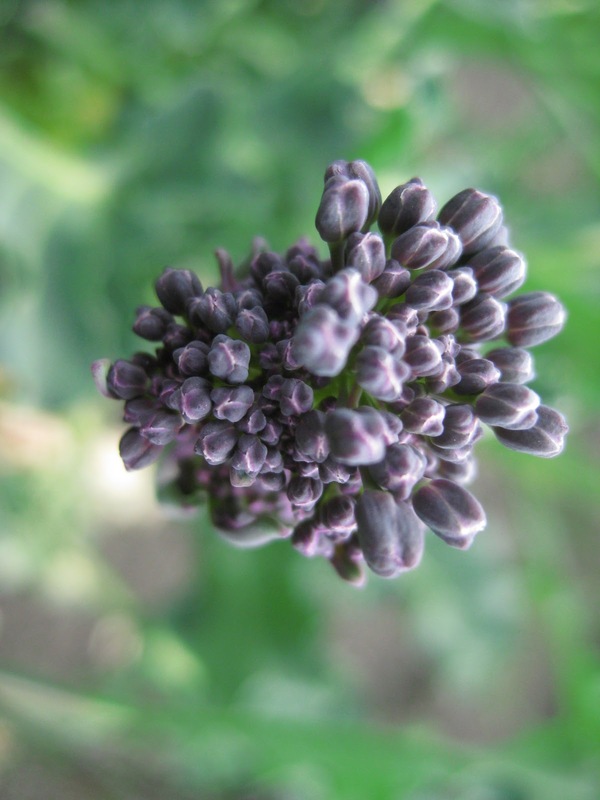 Close up of a purple sprouting broccoli head. This needs to be picked, any later and it will go into flower heads and then beautiful yellow flowers which actually provide a useful source for bees, butterflies and other insects early on before other flowers are available. The difficulty every year with the sprouting broccoli is that it is in what becomes the following year's potato patch (we have four rotating beds), and in general it is a struggle to find space for all the potatoes until the broccoli has finished! In fact, this year all the potatoes are in and the purple broccoli has only just finished in late May!